Rumors abound that the Drug Quality and Security Act (DQSA), H.R. 3204 will be debated and voted on in the Senate any day now (see “Waiting For The Senate To Act On A Track & Trace Bill, Again”). It already passed the House of Representatives back in September and the text is a compromise between the bill managers in both the House and the Senate, so everyone expects it to pass and be signed into law by President Obama. No one (except maybe some folks who don’t like the compounding part) wants to see its progress slowed, but there is a problem with the track and trace part that must be addressed before it is adopted or its implementation will quickly run into difficulties. The FDA would be given only one year after enactment to come up with standards for trading partners to exchange pedigree information—what is called “transaction information”, “transaction history” and “transaction statement” in H.R. 3204. 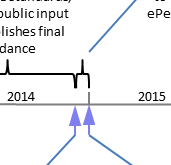 As many of us have learned over the years working in GS1 and GS1 US work groups, that’s a pretty tight deadline to come up with something as critical to the success of a complex, interoperable paper and electronic pedigree system. But the FDA can’t leap directly to publishing the standard(s). They must first figure out how to do it, then publish draft guidance, collect public comments, address the comments, and then finally publish final guidance—all within that one year. All I can say is good luck, but all that is not the real problem. The real problem is that, according to the letter of the bill, companies in the supply chain would need to begin using those standards to format and exchange the pedigree information on January 1, 2015. But because the bill has not yet passed, the timer has not yet started on the FDA standards development. Most of the deadlines specified in H.R. 3204 are based on the date that the bill would be enacted. For that type of deadline it does not really matter when the bill is enacted and signed into law. Even if Congress does not get around to it until December 31, 2014, the FDA and companies would still have the originally anticipated time to prepare. Unfortunately H.R. 3204 contains quite a few things that must begin specifically on the fixed date, January 1, 2015, regardless of when the bill is enacted. In fact, there are 13 references to that date in the text. I assume that was done to pacify the California Congressional delegation and the California Board of Pharmacy since this federal law would preempt their state pedigree law which would have begun to go into effect on that date. And that tactic might have worked fine if the bill had originally been signed into law last spring. But now, if it becomes a law next week, the FDA would have one year to publish the standards—and in that case, companies would need to start following those standards less than two months later. Unless those standards are laughably simple (and we won’t know until they publish their initial draft guidance), that won’t be enough time for companies to comply. Partial timeline for H.R. 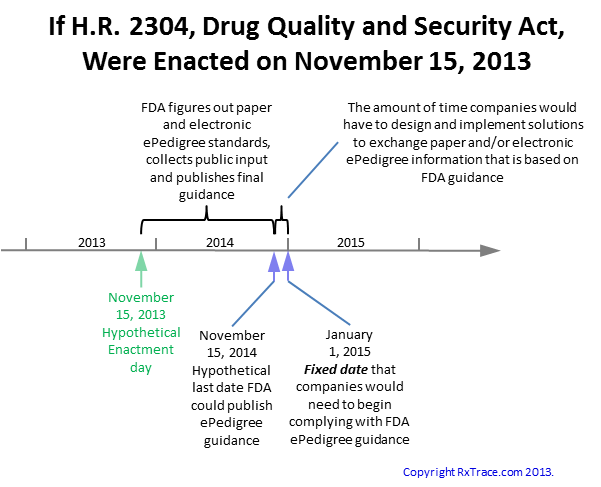 3204, Drug Quality and Security Act showing the tiny amount of time that companies would have to comply with formatting and exchange guidance from the FDA for paper and electronic pedigrees–“transaction information”, “transaction histories” and “transaction statements” if the bill were to be enacted next week. Click image to enlarge. If the bill does not pass until after the new year begins, the situation would actually exist where companies would be required to comply with standards and guidance on January 1, 2015 that would not even be published yet. That’s a problem. If the law passes without changing this situation, would the FDA have the authority to extend the compliance deadline to something that makes more sense? I don’t know, but I hope so. And if they do, they should make that fact public as soon as possible so that companies can plan for the new deadline. Or, if the bill is amended in the Senate for other reasons before it is passed, those “January 1, 2015” dates should be changed to be relative to the enactment date, just like all the other dates in the bill. Unfortunately, if the bill is amended, it will then be necessary to return it to the House of Representatives for another vote, leaving it open to further amendments and delaying its enactment. It’s a bit of a tangled web, but nothing too complex for Congress to work out, if they could just spend a few minutes on it. The law does not require “a complex, interoperable paper and electronic pedigree system” on Jan 1st, 2015. Most companies today pass the “transaction information”, “transaction history” and “transaction statement” data. The data serves to align the expected content with the future interoperable system. As a solution provider, that schedule is even tighter. We have to develop software that meets the guidelines in enough time for customers to deploy and test. That’s assuming that we can come up with data exchange standards that meet the not-yet-existing regulations. DPMS might do the job, but pedigree events aren’t close to being there. No current support for non-serialized events in EPCIS for starters. The net result will be people implementing to draft standards and dealing with late-breaking and incompatible changes. That will make integration between business partners very painful. Agree with Anonymous… the bill’s lot-level tracking transaction info/history/statement requirement is mostly met already by existing paper packing lists and/or electronic ASNs. Digitization of healthcare is a recognized societal good. The medical device UDI did not require Congressional action to go forward with final rulemaking. One hopes that Congress will decide to allow some form of digitization of pharma without imposing undue burdens and unworkable deadlines. FDA had to exercise regulatory discretion (not enforce) a law Congress passed which required that every medical device had to have the name of the manufacturer on each device(MDUFMA 2004). When Congress passes laws that are totally unworkable, regulators have no choice but to exercise regulatory discretion. One hopes that Congress will not place FDA in another no-win situation. I also found the Jan 1, 2015 “hard-coded” date surprising in the text of the bill. With the uncertainty of draft state of the bill and the enactment date, it puts industry and solution providers in a very difficult position of designing solutions based on uncertain requirements and timelines. This is definitely a concern, having tracked the FDA’s UDI regulation and the ongoing timing delays and uncertainties around that regulation for several years. FDA did the right thing with UDI, in my opinion, by starting the clock ticking based on the enactment date, rather than a fixed date.